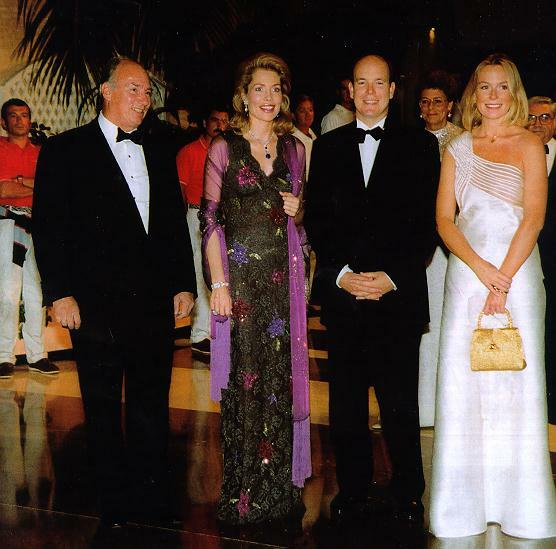 January 25 1999: According to Fraternit Matin of Abidjan, Prince Rahim Aga Khan was present at the inauguration of the first of three phases of the "Centrale thermique d'Azito" project. This project produces electricity from gas and will provide 15% of the electricity need of Ivory Coast. February 8, 1999: Attended the funeral ceremony of King Hussein of Jordan with members of his family. Begum Inaara paid her respect to Queen Noor. March 11-17, 1999: Past glory, new life Al-Ahram Weekly, 11 - 17 March 1999. April 8, 1999 NEW DELHI, April 7: According to Express News Service, The Aga Khan Foundation (AKF) has allocated Rs 16 crore to its current partners to help them promote primary education and healthcare in the rural areas. The 17 non-governmental organisations that are current partners of the AKF, will be enhanced and strengthened with the funding, claims the AKF's national committee's chairman, A.M. Khusro. 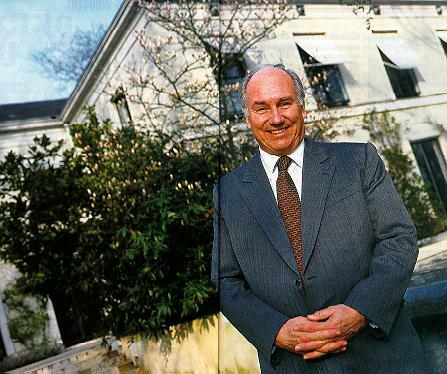 27th April, 1999: France's Minister for Foreign affairs, Hubert Vedrine, and His Highness the Aga Khan, Imam today signed an Accord of Co-operation between France and the Association Aga Khan, whose members include some of the principal agencies and affiliates of the Aga Khan Development Network. 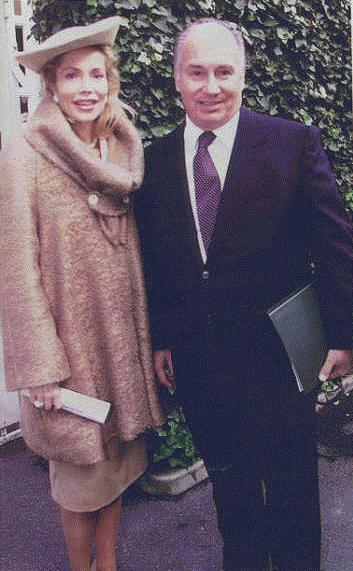 May 4th, 1999: According to a Press Release from Aiglemont, President and Mme. 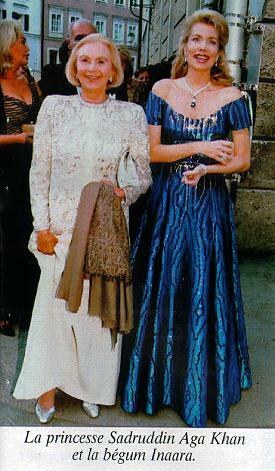 Suzanne Mubarak, who is patron of major cultural heritage initiatives in old Cairo, were hosting the Aga Khan and his wife, the Begum Inaara Aga Khan, to a luncheon attended by selected members of the Cabinet to discuss the potential for development of historic Cairo centered on Azhar Park and its immediate vicinity. The 30 hectare Azhar Park will be Cairo's largest designed green space. May 12, 1999: KARACHI - The Aga Khan Educational Services (AKES) plans to construct an 'education city' spread over 400 acres, off Super Highway, to initially set up a software park and a university for research, teaching, training and development of human resources in various fields of science and technology, says the Recorder Report. 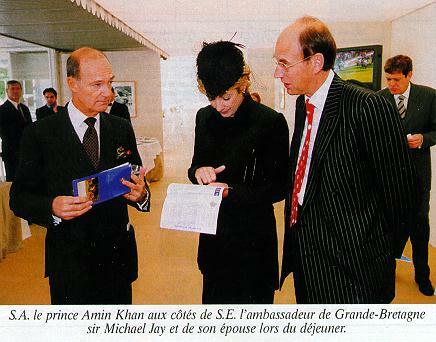 May 16, 1999: Paris (Reuter) Daniel Lahalle writes "Horse racing-Sendawar in Guineas triumph for Aga Khan"
May 31, 1999: Forbes Magazine in its cover page story asks the question "The world wondered if young Prince Karim could fill the Aga Khan's shoes. Four decades later, the verdict is in." ... Today the doubts have been put to rest. 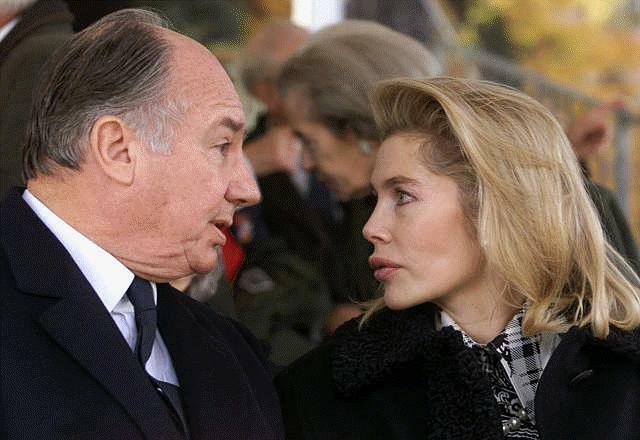 As the Ismaili Shia Muslims' 49th imam, Prince Karim Aga Khan IV has not only helped his people. He has also changed the face of global philanthropy. 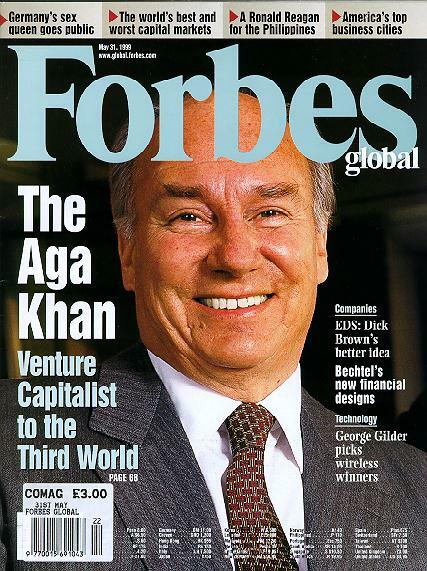 The magazine contains also other sidebars: a table under the heading The Aga Khan has financed over 100 small companies; some have gone public from Aga Khan Fund for Economic Development; Bloomberg Financial Markets, Stepping into fractures by Pranay Gupte, and An entrepreneur in the poverty industry by the same writer. 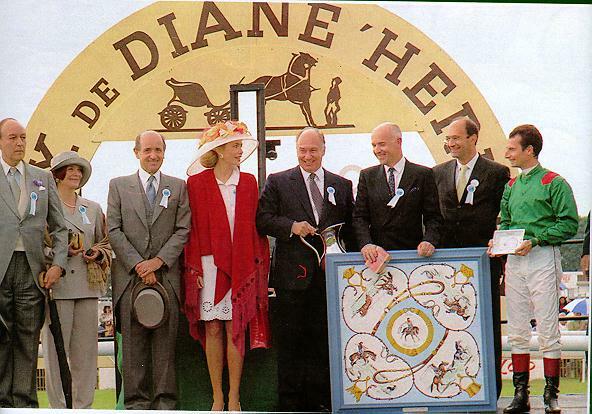 July 1, 1999: Le Prix de Diane (horse race) is one of several prices won by the Aga Khan this season in France and Britain. 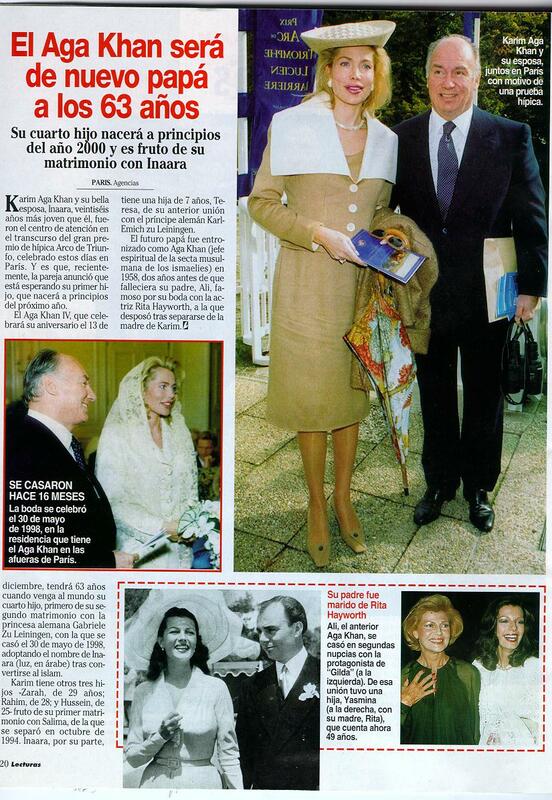 Hola gives photos of the Aga Khan and Begum Inaara in its July 1st issue. (see also below in photo album section). The French counter part Oh La! 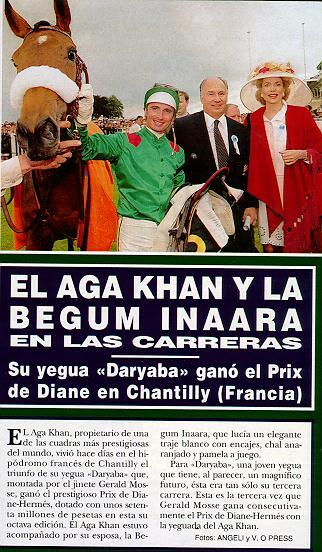 dated June 30 gave also news under the title "Karim Aga Khan triomphe a Chantilly et Ascot. Darayaba, Sendawar et Enzeli, ses pur-sang prodiges, trustent les grands prix." 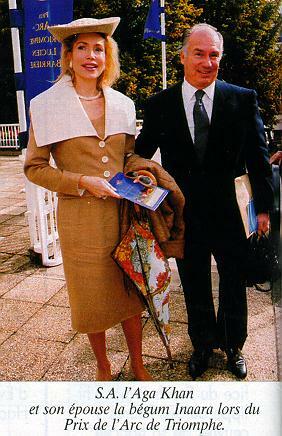 September 2, 1999: According to the Madagascar journal MIDI MADAGASCAR President Ratsiraka meet Prince Aga Khan in Paris before flying to Moncton in Canada for the Francophone summit. Cooperation in the field of education (creation of schools) as well as health (cholera eradication) and development was discuss. The meeting and an interview was shown in the Malagasy TV. 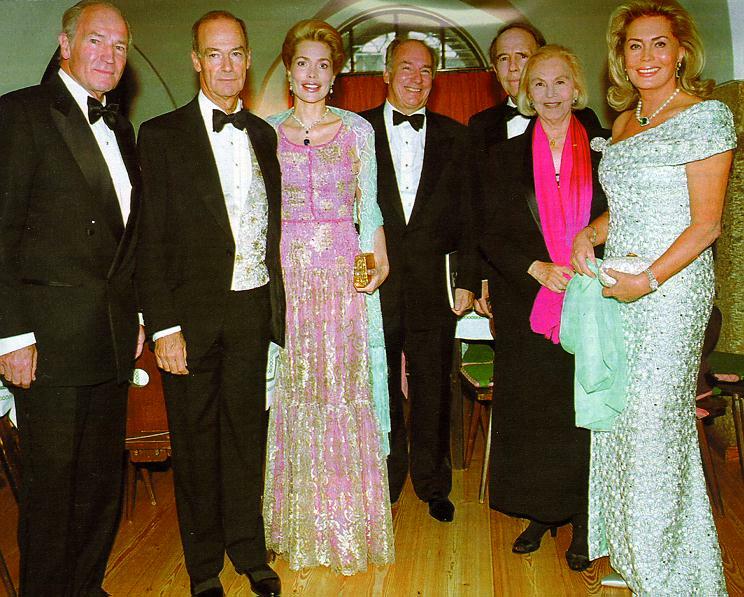 August 27, 1999: Visited Salzbourg for 3 days with Begum Inaara, Prince Amyn, Prince Sadruddin and Princess Aliya. Articles from Point de Vue (France - 8 September 1999), Oh La! (France), Hello! (UK 14 September 1999) and Hola! (9 September 1999) to follow second week of October. Meanwhile enjoy the photographs: pv1 (37K), pv2 (15K), pv3 (30K), pv4 (36K), ho1 (101K), ho2 (66K), ho3(54K), ho4 (114K), ho5 (223K) By the way, quality of those photographs is not great so better quality new scans possibly from originals will replace these ones third week of October (with our apologies). September 19, 1999 "His is a life of both unbelievable privilege and extraordinary commitments. The educational and development work of the Aga Khan Foundation stretches out to Kenya, Canada, Uganda, India and the newly-emerging states of South East Asia. His own jet will take him to Geneva at lunchtime, Monaco on Friday, Ireland on Saturday. Over three continents he will deal with schools, office blocks, agricultural regeneration, yacht clubs and finally with racing matters." writes The Daily Telegraph. September 23, 1999:"The Aga Khans expecting a child" writes the Daily Recorder dated September 23rd and the Point de vue dated 29 September. 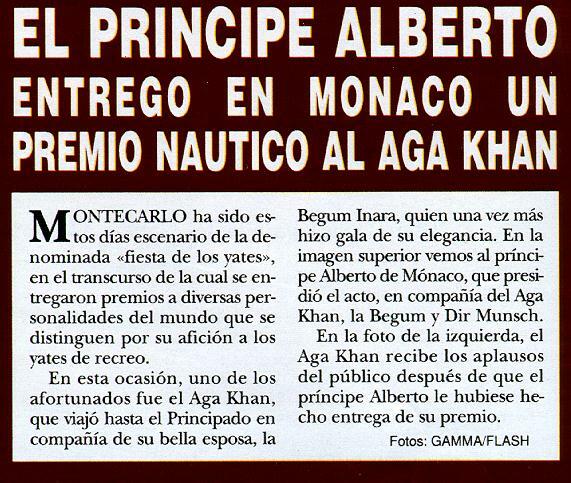 later, "The Aga Khan will become father once again at age 63" writes the Spanish Semana dated October 22 giving photos of Begum Inaara, Hazar Imam ans also Princess Yasmin and Prince Aly Khan. 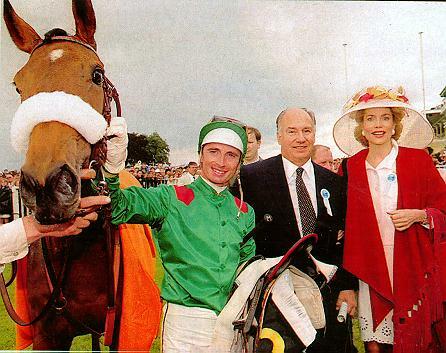 October 13, 1999: Point de Vue dated 13th october gives photos of Prince Amyn at the Prix de L'Arc de Triomphe (Longchamp). 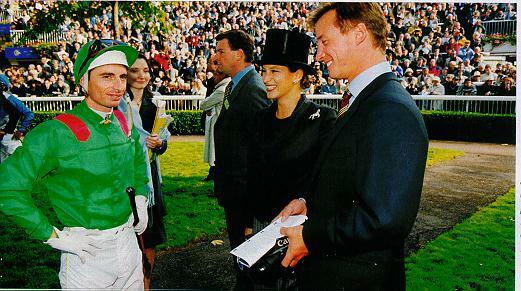 Also at the horse race, Hazar Imam and Begum Inaara as well as Princess Zahra and Marc Boyden talking with Gérald Mossé. More photos from Hello and Hola! Magazine are below in the Photo Album section. 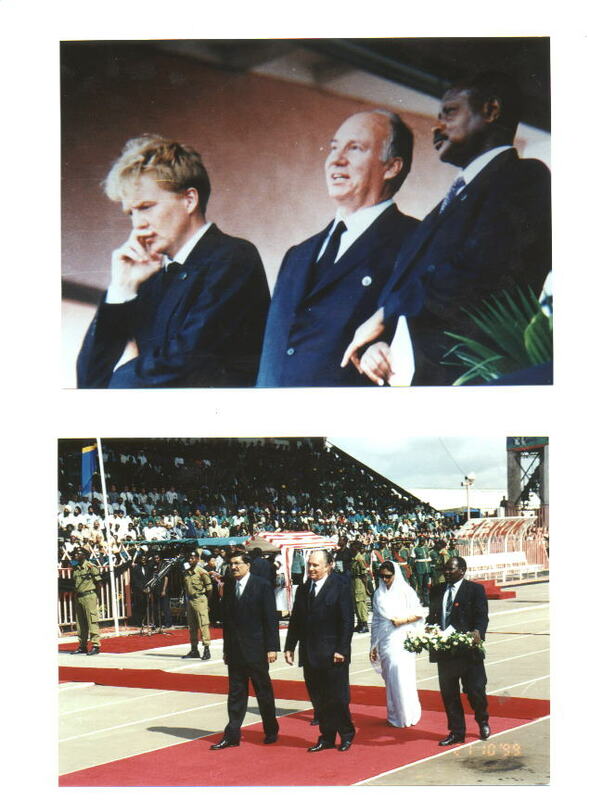 October 20, 1999: " I had the privilege of knowing your husband from the time he assumed the Presidency of Tanzania, as leader of the First East African nation to achieve independence. Throughout his years in office, I had the opportunity to admire the steadfastness and integrity of purpose Mwalimu applied to Tanzania's development challenges," said the Aga Khan in his personal message of condolence to Mama Maria Nyerere following the death of her husband, Mwalimu Julius Nyerere according to The African. He arrived Wednesday and attended the funeral ceremonies on Thursdayy 21st October 1999. 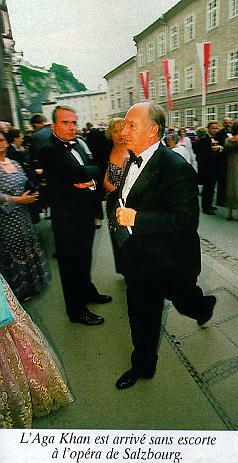 According to New Vision, the Aga Khan was amongst the Guests of Honour (photo). 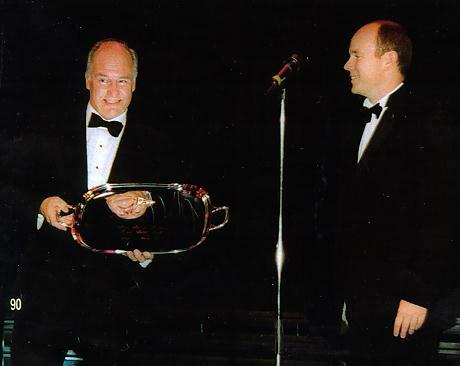 November 10, 1999:His Highness the Aga Khan, Imam (spiritual leader) of the Ismaili Muslims today addressed industry leaders, government officials and development executives from around the world at the World Bank on applying information technology to the problems of human capital and development needs. According to the Aga Khan, it is only by positioning users to shape content and applications, that the full potential of this technology will be realized and its perceived threat to their cultures addressed. Lauding World Bank President James Wolfensohn's promotion of culture as a dimension of development, the Aga Khan said "for too long, culture was dismissed as either irrelevant or elitist, or was seen as an obstacle to development." November 11, 1999: "On the basis of my experience in culture and development over the last 30 years, I believe that it is critical to build capacity more generally to position users to be active participants in the advances in the shaping of content and applications. Only then will the full potential of the new information technology begin to be realised. And only then will the concern of some, that the Internet poses a threat to their cultures, be addressed." Said the Aga Khan at the World Bank infoDev Conference, Washington, D.C. Full text of Speech here.